Muscular endurance is trained specifically and in more of an aerobic and oxygenated pathway, whereas muscular strength is trained in an anaerobic ATP-CP and Glycolytic pathway. There does seem to be a relationship between muscular strength and muscular endurance. However if a person only trains to improve strength then that person is not improving his muscular endurance that much. The definition of muscular strength is: the ability of your body's muscle to generate force in a short period of time. This type of activity relies on anaerobic energy--allowing you the short burst of energy you need to lift a heavy weight. 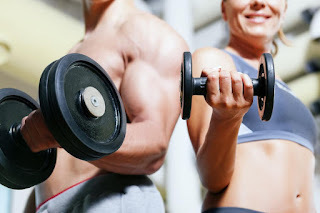 When you increase your strength, you're often also increasing the size of your muscles as well as strengthening your connective tissues. On the other hand the definition of muscular endurance is: the ability to sustain muscle contraction over a period of time without undue fatigue. By looking at these definitions we can see that muscular strength involves using heavier weights for a shorter period of time, and muscular endurance involves using a moderate weight for a longer period of time. The pathways utilized are different for each. For muscular strength the pathway utilized would be more ATP-CP and some glycolysis, and muscular endurance would utilize more of glycolysis and oxygen pathways. The physiology of a muscle is that each muscle contains muscle fibers. Each fiber is innervated by a single axon; a motor neuron may have a hundred or more axons. A single motor neuron, with all the fibers it controls, is a motor unit. As the brain's signal for contraction increases, it both recruits more motor units and increases the "firing frequency" of those units already recruited. Even during a "maximal voluntary contraction", it is unlikely that all the motor units are activated. All joints, however, are set up as lever systems: the fulcrum where two bones meet, one force produced by the muscle, and the other by a load. Strength is not just muscle force, but muscle force as modified by the mechanical advantage of the joint. To complicate matters further, this mechanical advantage usually varies with joint rotation, as does the muscle force. The net result is strength that varies with joint angle and may be somewhat decoupled from muscle force. Joint strength can be increased with exercise. Muscular endurance activities would include activities such as: martial arts, jogging, triathalon, swimming, wrestling, tennis, circuit training. Muscular strength activities would include activities such as: weight lifting, power lifting, gymnastics.